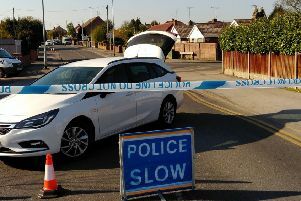 Officers investigating a hit-and-run in Mansfield town centre are asking for anyone who witnessed what happened to come forward. The victim was stood on Leeming Street at around 4.45am on Monday 6 April, 2015, after leaving the Rewind night club on 6th April, 2015. He was struck by a dark-coloured Skoda Octavia which mounted the pavement. The car also collided with an electric box before heading off in the wrong direction up a bus lane and travelling down Clumber Street, again in the wrong direction. It is believed the car was parked in Leeming Street prior to the incident and that the driver may have been involved in an altercation with people outside the Bowl in Hand pub. Detective Constable Kelly Holloway: “Unbelievably the victim did not sustain major injuries and is currently recovering well. Had the car not struck the electric box this incident could easily have ended in tragedy. Nottinghamshire Police would like to hear from anyone who witnessed the incident or anyone who has any information which may help. Officers would also like to hear from any local garages which have had a Skoda Octavia booked in for the repair of front end damage. If you can help please call Nottinghamshire Police on 101 quoting incident number 282 of 6 April, 2015 or Crimestoppers anonymously on 0800 555 111.